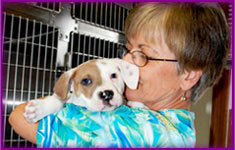 Our packages are designed to fit your budget so you can start your new pet on the road to a happy and healthy life. Keeping our pets healthy is the best way to extend their lives, so regular physical exams, vaccinations and preventive care are a must. At Brambleton Veterinary Hospital we are dedicated to caring for all the wellness needs of your pets throughout their adult years. 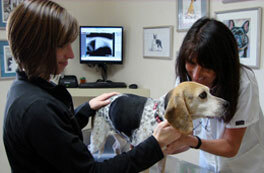 Early detection of health issues is the key to successful treatment for pets in their "Golden Years". Under the care of our veterinary team, you can continue to provide good quality of life for your senior canine and feline companions. If hospitalization is necessary, you can be assured that your pet will benefit from up to date medical technology along with kind and gentle care. 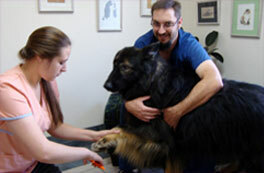 Our goal is to partner our veterinary skills with our compassion for pet health care in a way that will provide for a speedy recovery of your pet. We also cooperate with Virginia Tech, Carolina Veterinary Specialists and North Carolina State University for referrals of complicated procedures, CAT scans and MRI’s. Whether you are considering an elective procedure or are facing a medical crisis that requires surgery, you can rest assured that our experienced team of doctors and technicians, who operate in our state of the art surgical suite, will skillfully perform the procedure needed by your pet. 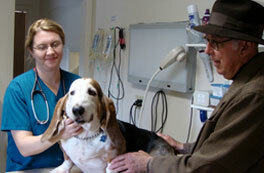 Surgical and dental patients are admitted to the hospital from 7:00am – 8:30am in order to begin the preoperative examination, lab work and pre-op medications to insure your pet’s health and comfort throughout the procedure. The admission process will include a review of your pet’s surgical procedure, medical history, and confirmation of pre-op fasting along with an explanation of blood screens that may be recommended prior to sedating your pet. Our surgical team will monitor your pet’s recovery in our Intensive Care Unit and will gladly inform you of his or her progress throughout the day. Upon discharge, you will be given written post-op care instructions and you will also receive a phone call the following day to check on your pet’s continued recovery at home. 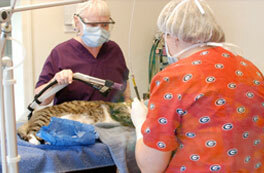 Note: Highly specialized surgical procedures are referred to either Virginia Tech or Carolina Veterinary Specialists.